11/05/2015: Minor reorganization, moved Irvington Mfg. here. 10/31/2015: Added a 1901 advertisement for Smith & Hemenway. 12/02/2011: Added Red Devil 999 8 Inch Universal Button's Pliers. 11/21/2011: Added Red Devil 444-7-1/2 "Giant Grip" Pliers. 09/07/2011: Added Red Devil [1000-8] Button's Pattern Pliers. 06/06/2011: Added Irvington Manufacturing Button's Pattern Pliers. 05/09/2011: Added Red Devil 925[-6-1/2] Combination Pliers. 07/04/2010: Added Red Devil 1000 Button's Pattern Pliers. 06/18/2010: Added S&H 1650-8 Lineman's Pliers. 06/13/2010: Moved to a separate page. 06/03/2010: Added a IMCO No. 3700 Lineman's Universal Pliers. 02/28/2009: Added Red Devil 1950-8 Lineman's Pliers. 02/17/2009: Added Red Devil 1050 Lineman's Pliers. 07/13/2008: Added Smith & Hemenway Sure Grip Button's Pliers. 03/14/2008: Added a Smith & Hemenway 1/2-Drive Ratchet. 03/13/2008: Added a Smith & Hemenway No. 1971 Socket Set. 1901 Advertisement for Smith & Hemenway Pliers. [External Link]. The Smith & Hemenway Company (S&H) was founded in 1898 by Landon P. Smith and John Francis Hemenway. The company operated as a manufacturer and importer of hardware items, with offices in New York City and a factory in Irvington, New Jersey. One of the company founders, Landon P. Smith, was a notable inventor with a number of patents for pliers and glass-repair tools. The company also acted as sales agents for other manufacturers. The advertisement at the left, published on page 17 of the July 25, 1901 issue of Hardware, shows an illustration of No. 777 needlenose pliers. Note that the text at the bottom of the ad mentions Utica Drop Forge & Tool, indicating that S&H were already agents for Utica, and the pliers in the ad were probably made by Utica. 1901 Advertisement for Smith & Hemenway Tool. [External Link]. 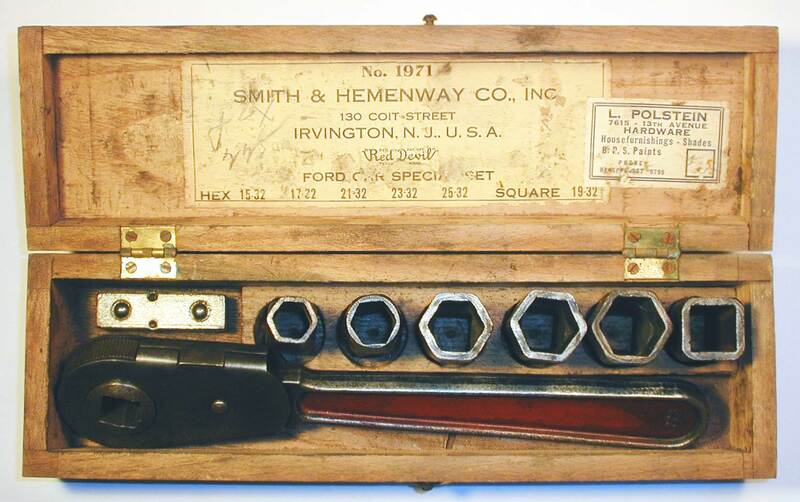 From its early years Smith & Hemenway had a close association with the Irvington Manufacturing Company, a maker of pliers, tools, and other hardware items located in Irvington, New Jersey. One of the founders of S&H, John F. Hemenway, held positions of secretary, treasurer, and director with both S&H and Irvington Manufacturing. Based on this association, it's likely that Irvington Manufacturing was a major supplier and manufacturing partner for S&H from the beginning. At some later point the two companies apparently merged, although we haven't found the exact date. However, a 1916 notice in a trade publication noted that S&H was moving its executive offices to 130 Coit Street in Irvington "where their factory is located". 1917 Notice for Red Devil Pliers. [External Link]. Tools from Smith & Hemenway were frequently marked with the "Red Devil" trademark, either with or without the company name or "S. & H." initials. 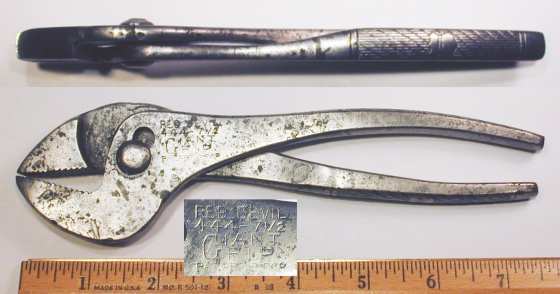 The notice at the left was published on page 41 of the October 15, 1917 issue of The Horseless Age and describes the features of Red Devil combination pliers. The text notes the company address as 130 Coit Street in Irvington, New Jersey. By 1926 Smith & Hemenway had been acquired by the Crescent Tool Company of Jamestown, New York. Production of the S & H line continued under Crescent for a number of years, and the S & H tools were listed in the Crescent catalogs, beginning with catalog No. 17 in late 1926. Currently our only catalog for Smith & Hemenway is an illustrated price list from 1914. Crescent Tool included the full S&H product line in their catalog No. 17, which was published in 1926 shortly after acquiring S&H. Smith & Hemenway tools were sold through various industrial distributors, and the catalogs of these companies provide descriptions and illustrations of the tools available at that time. Fig. 1. Smith & Hemenway "Sure Grip" 8 Inch Button's Pattern Pliers, with Insets for Side View and Reverse Detail, ca. 1901-1910. Fig. 1 shows an early pair of Smith & Hemenway "Sure Grip" 8 inch Button's pattern pliers, marked "S.H. Co." and "Sure Grip" on one side, with a "Pat'd Feb. 5, 01" patent notice on the reverse. The patent date corresponds to patent #667,411, issued to S.S. Vaughan et al in 1901, with assignment to Vaughan & Bushnell Manufacturing. The patent describes a limit mechanism to bring the wire-cutting slots into alignment, as a convenience for one-handed operation. Fig. 2. Red Devil 999 8 Inch Universal Button's Pliers, with Insets for Side View and Construction Detail, ca. 1910 to 1920s. Fig. 2 shows a pair of Red Devil 999 8 inch "universal" Button's pliers, stamped with "Red Devil" and "S&H Co. U.S.A." near the pivot. The overall length is 8.3 inches, and the finish is plain steel, with pitting due to rust. The middle left inset shows a close-up of the jaws. Note that the center cutting slot is nearly at a right angle to the face of the pliers, a construction detail also noted in Kraeuter's Button Pattern pliers. Most other makers place the center slot at an angle, including the original J.M. King Button pliers. The jaws of these pliers provide gripping areas for flat, square, and rounded objects. Fig. 3. Red Devil [1000-8] 8 Inch Button's Pattern Pliers, with Insets for Side View, Construction, and Marking Detail, ca. 1905-1915. Fig. 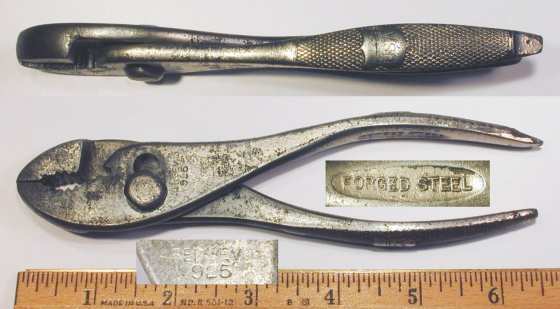 3 shows an early pair of Red Devil [1000-8] 8 inch Button's Pattern pliers, stamped "S&H Co." and "N.Y. U.S.A." around the pivot, with "Red Devil" and "Trade Mark" across the center (see middle right inset). The middle left inset shows a close-up of the jaws. Note that the center cutting slot is at a right angle to the face of the pliers, a construction detail also noted in Kraeuter's Button Pattern pliers. Most other makers place the center slot at an angle, including the original J.M. King Button pliers. Another detail to note is that the angled sides of the nose have been ground flat and terminate abruptly over the pivot area. This construction detail differs from the Kraeuter examples, which have the outer sides ground to a convex surface, with a smooth transition over the pivot area. The "N.Y. U.S.A." marking provides an important clue to the production date. In their earlier years the company listed an address in New York City, but from around 1917 onward, Smith & Hemenway listed their address in Irvington, New Jersey. Thus these pliers are probably of earlier production. The S. & H. button's pliers are generally similar to examples made by Kraeuter, but the flat sides to the nose provide a distinctive difference. An example of a similar Kraeuter model can be seen as the Kraeuter 1841-8 Pliers. Fig. 4. Red Devil 1000 10 Inch Button's Pattern Pliers, with Insets for Side View, Construction, and Marking Detail. Fig. 4 shows a pair of Red Devil 1000 10 inch Button's Pattern pliers, stamped "S&H Co." and "U.S.A." near the pivot. The overall length is 9.9 inches, and the finish is plain steel. The S. & H. button's pliers are generally similar to examples made by Kraeuter, but the flat sides to the nose provide a distinctive difference. An example of a similar Kraeuter model can be seen as the Kraeuter 1841-10 Pliers. Fig. 5. Red Devil 1050 7 Inch Lineman's Pliers, with Insets for Side View and Reverse Detail. Fig. 5 shows a pair of Red Devil 1050 7 inch lineman's pliers, stamped with the brand and model near the pivot. Fig. 6. S&H 1650-8 8 Inch Lineman's Pliers, with Inset for Side View. Fig. 6 shows a pair of S&H 1650-8 8 inch lineman's pliers with a Button's cutting slot, stamped with "S.&H. Co." and model number around the pivot. The overall length is 8.0 inches, and the finish is plain steel. These pliers are equipped with one Button's-style cutting slot on the side, a somewhat unusual feature for lineman's pliers. Fig. 7. Red Devil 1950-8 8 Inch Lineman's Pliers, with Insets for Reverse and Side View. Fig. 7 shows a pair of Red Devil 1950-8 8 inch lineman's pliers, stamped with the brand and model. The next two figures show examples of the Red Devil 925 series of combination pliers. The 1914 S&H catalog offered the 925 pliers in sizes 6.5, 8, and 10 inches, at net prices of $2.75, $3.50, and 4.25, respectively -- per dozen! Fig. 8. Red Devil 925[-6-1/2] 6.5 Inch Slip-Joint Combination Pliers, with Insets for Side View and Marking Detail, ca. 1912-1920. Fig. 8 shows a pair of Red Devil 925[-6] 6 inch combination pliers, stamped with "Red Devil" and the model number near the pivot. The handles are marked with "U.S.A." on a shield in the dimpled gripping pattern, with "Forged Steel" forged into the undersides. The overall length is 6.6 inches, and the finish is nickel plating, with extensive losses due to wear and rust. These are heavy, well-built pliers with numerous features to earn their rating as "combination pliers". The jaws include two gripping areas for round objects, plus a V-groove for holding small pins (see lower inset). There's also a slot for cutting wire, and the end of one handle is flattened for use as a screwdriver or light-duty prybar. 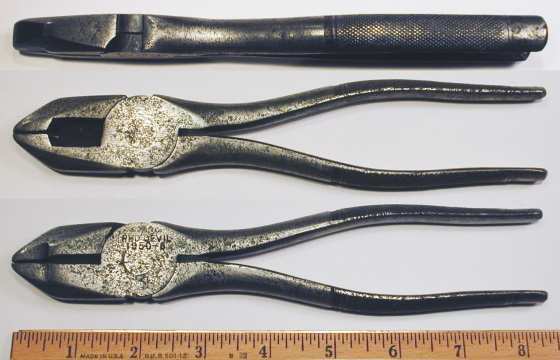 Readers familiar with Kraeuter & Company will recognize the similarity of the handle pattern and forged markings of these pliers with the early Kraeuter production. Kraeuter used a dimpled field with a diamond in the center instead of the shield, and the Kraeuter "Forged Steel" markings are nearly identical. An example of the equivalent Kraeuter model can be seen as the Kraeuter 356-6 Combination Pliers. Based on the close similarity, it's likely that Kraeuter made these pliers as contract production for S&H. Fig. 9. Red Devil 925-10 10 Inch Combination Pliers, with Insets for Side View and Marking Detail, ca. 1912-1920. Fig. 9 shows a pair of Red Devil 925-10 10 inch combination pliers, marked "U.S.A." on the handle with "Forged Steel" on the underside. The overall length is 9.9 inches, and the finish is nickel plating. Readers familiar with Kraeuter & Company will recognize the similarity of the handle pattern and forged markings of these pliers with the early Kraeuter production. Kraeuter used a dimpled field with a diamond in the center instead of the shield, and the Kraeuter "Forged Steel" markings are nearly identical. An example of a similar but smaller Kraeuter model can be seen as the Kraeuter 356-8 Combination Pliers. Based on the close similarity, it's likely that Kraeuter made these pliers as contract production for S&H. Fig. 10. Red Devil 444-7-1/2 "Giant Grip" Combination Pliers, with Insets for Side View and Marking Detail. Fig. 10 shows a pair of Red Devil 444-7-1/2 "Giant Grip" slip-joint combination pliers, marked "Red Devil" and "Giant Grip" near the pivot, with "Pat. Appld For" below. The overall length is 7.7 inches, and the finish is plain steel, with extensive pitting due to rust. Fig. 11. Red Devil 1906 Fencing Pliers, with Insets for Side View and Jaw Detail. Fig. 11 shows a pair of Red Devil 1906 fencing pliers, marked "S.&H. Co. U.S.A." near the pivot. The overall length is 10.3 inches, and the finish is plain steel. By the early 1920s Smith & Hemenway were offering pressed-steel socket sets. The notice at the left was published on page 714 of the January, 1922 edition of Hardware Dealers' Magazine has an illustration and description of the company's No. 1973 socket set. The distinctive ratchet in the illustration allows us to identify the maker of this set as the Syracuse Wrench Company. An example of a similar set can be seen in the next figure. Although Smith & Hemenway was not generally known as a maker of automotive service tools, this next figure shows that the company did offer socket sets at some point. Fig. 12. Smith & Hemenway No. 1971 Pressed-Steel Socket Set, ca. Early 1920s. Fig. 12 shows a Smith & Hemenway No. 1971 pressed-steel socket set in a wooden box, consisting of a ratchet, drive plug, a square socket, and five hex sockets. The inside cover has the original printed label for the set, indicating that this was a "Ford Car Special Set", and giving the sizes of the sockets. In addition, a second tag identifies "L. Polstein Hardware" as the store where the set was purchased, and even shows the $2.25 sales price. The set as shown includes Mossberg sockets (plus one unmarked) with sizes, from the left, 15/32, 17/32, 21/32, 23/32, 25/32, and 19/32 (square). Readers should keep in mind that pressed-steel sockets were specified 1/32 oversize, so that the sockets in this set were intended to fit nut sizes 7/16, 1/2, 5/8, 11/16, 3/4, and 9/16 square. An explanation of this convention can be found in the section on Pressed-Steel Socket Sizes. Our estimate of the manufacturing date of this set is based primarily on the published notice above for S&H socket sets, which suggests that the company began offering them shortly before 1922. Syracuse Wrench itself is known to have produced pressed-steel socket sets with this ratchet design from 1915 onward. Fig. 13. Smith & Hemenway 1/2-Drive Ratchet From No. 1971 Socket Set, with Inset for Side View, ca. Early 1920s. Fig. 13 shows the 1/2-drive ratchet from the Smith & Hemenway No. 1971 set, unmarked except for a "775" code forged into the end of the shank. The ratchet is constructed with a forged steel handle, and a sheet metal carrier holds the drive gear in contact with the pawl. In operation, the drive gear and carrier assembly pivots around an anchor pin, with a spring to provide tension. The drive gear is notable for the relatively fine teeth, a feature not often seen in early ratchets of this type. This ratchet design has been identified as a product of the Syracuse Wrench Company, which used this ratchet model in a number of their own socket sets. An example of this ratchet model from a Syracuse Wrench No. 2 "Champion" socket set can be seen as the Syracuse Wrench Fine-Tooth Ratchet. The distinctive design suggests that it may have been described by a patent filing, although no patent notice is marked, and no patent has been found. The Irvington Manufacturing Company was a maker of pliers (and possibly other tools) operating in Irvington, New Jersey during the early 1900s. The company had a close relationship with Smith & Hemenway, as John F. Hemenway was an officer and director of both companies. Irvington Manufacturing is believed to have been the primary manufacturer for S&H, and by 1916 the two companies had formally merged. 1909 Advertisement for Irvington Manufacturing Company. [External Link]. The illustration at the left shows an advertisement for the Irvington Manufacturing Company published in the March 4, 1909 issue of The Iron Age. Irvington Manufacturing appears to have used several different markings for its tools. Tools may be marked with the company name, with "Irvington" in a diamond logo, or with "IMCO" in a diamond. Fig. 14. Irvington Manufacturing 5 Inch Button's Pattern Pliers, with Inset for Side View and Marking Detail, ca. Early 1900s. Fig. 14 shows a pair of Irvington Manufacturing 5 inch Button's Pattern pliers, stamped with "Irvington Mfg. Co." near the pivot. Fig. 15. IMCO No. 3700 7 Inch Linemans's Universal Pliers, with Insets for Top View and Reverse Detail, ca. 1905-1915. Fig. 15 shows a pair of IMCO No. 3700 7 inch lineman's universal pliers, stamped with "IMCO" in a diamond logo across the pivot.